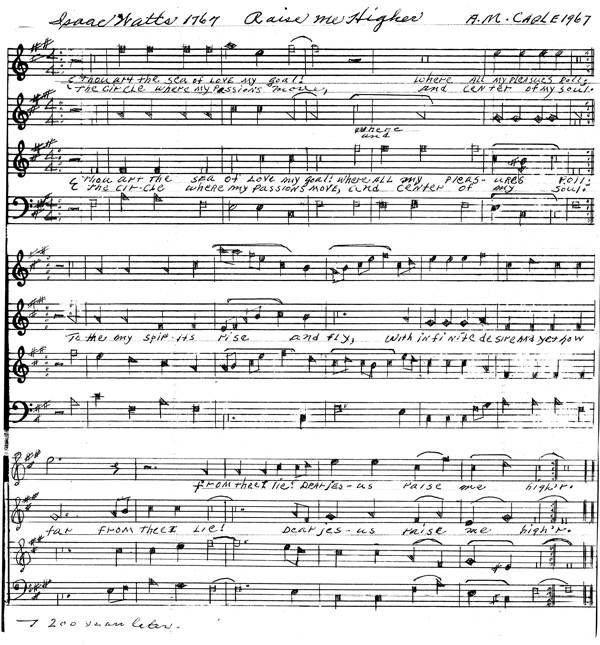 The sacred harp is not a particular piece of musical equipment, but a reference to the human voice, "the musical instrument you were given at birth" (http://fasola.org). 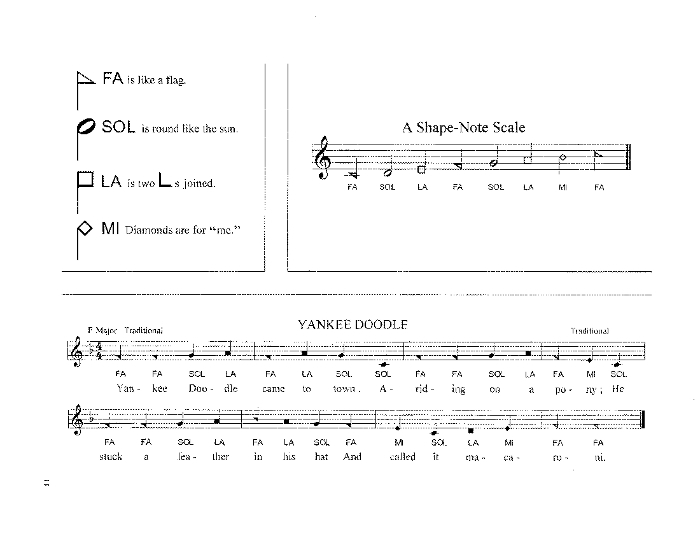 A form of shape-note singing, sacred harp music employs a scale of four shaped notes: fa, sol, la, and mi. The page to the right provides an example of these notes, using a familiar tune to which you can practice. Click on it for a larger version. Click here for the original source at the Smithsonian. The dispersed harmony associated with sacred harp singing requires that each voice-treble, alto, tenor, and bass-be given its own line. Typesetting these lines gives sacred harp books their distinctive rectangular shape. In practice, different voices in the music will cross one another, providing a lively chorus of ever-changing voices. 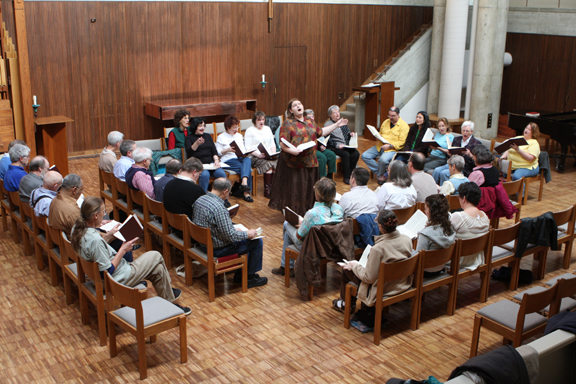 Sacred harp singings, commonly called conventions, follow a familiar pattern: singers sit facing one another in a square, arranged in sections by voice. Both women and men sing tenor and treble parts, starting in different octaves. The conductor leads from the center of the square, and all participants have a chance to lead throughout the day. Customarily, the conductor directs the tempo with one hand only. There are breaks for meals and fellowship, as most singings last a full day. This photo from the sacred harp singing held at Candler in February shows the singing group arranged in a square with the conductor in the middle. Click here to view a slideshow from a Sacred Harp Sing at Cannon Chapel at Emory University. 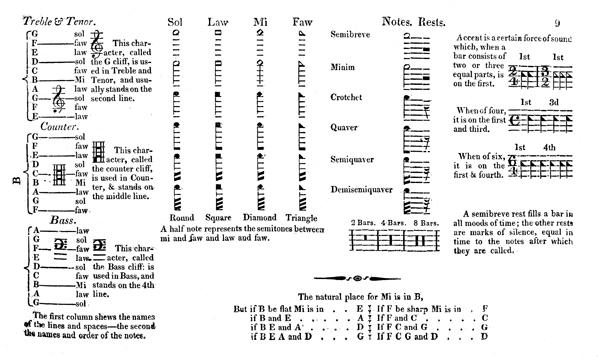 William Little and William Smith's The easy instructor is often credited as the origin of the type of shaped note employed in The Sacred Harp and other tune books of its kind. Some early editions of the book note that Little and Smith borrowed this system from fellow Philadelphian John Connelly. With time, singing instructors brought the system from Pennsylvania into the Carolinas, Virginia, and further south. Click on the image for a larger version. 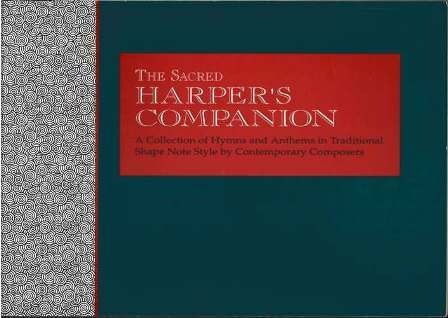 The Southern Harmony is one of the most widely known sacred harp collections. William Walker was the brother-in-law to B. F. White, compiler of the Sacred Harp. One story recounts that Walker and White worked on The Southern Harmony together, but when Walker headed north to find a publisher, he and the publishers entered into a contract that gave no credit to B. F. White and prevented him from receiving any money from the venture. B.F. White and William Walker never spoke again. 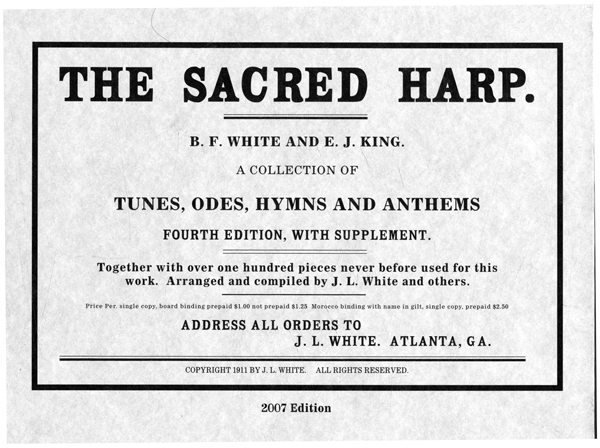 White published The Sacred Harp nine years later. Click on the image to see a larger version. 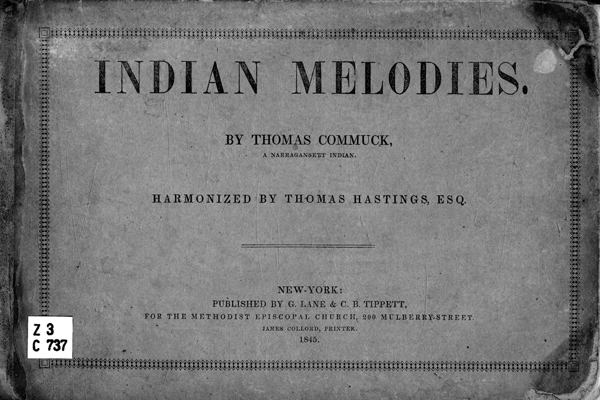 To those who are tenacious and scrupulous as to the different terms by which musical sounds should be expressed, allow us to say that we have carefully and earnestly studied the subject for forty-seven years, during the last twenty-seven years of which period we have been especially vigilant in seeking for musical terms more appropriate to the purpose than the four names used in this book; but candor compels us to acknowledge that our search has been unavailing. The scheme which our prolonged and laborious examination has inclined us to prefer to all others has had the sanction of the musical world for more than four hundred years; and we scarcely think that, on this subject, we can do better than abide by the advice-"Ask for the old paths, and walk therein." Lowell Mason, a leader in singing schools throughout the early 19th century and the creator of the first music curriculum for public schools in Boston, preferred the continental style of round notes and a seven-note system to the shaped notes of sacred harp style. Mason's style came to dominate in New England and, eventually, in most American church music. 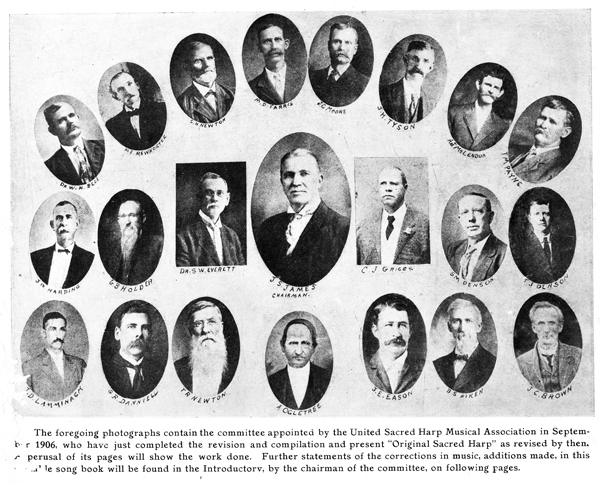 In 1906, twenty-three sacred harp singers and writers, under the direction of Joe S. James, were appointed by the United Sacred Harp Musical Association and charged with revising the Sacred Harp. 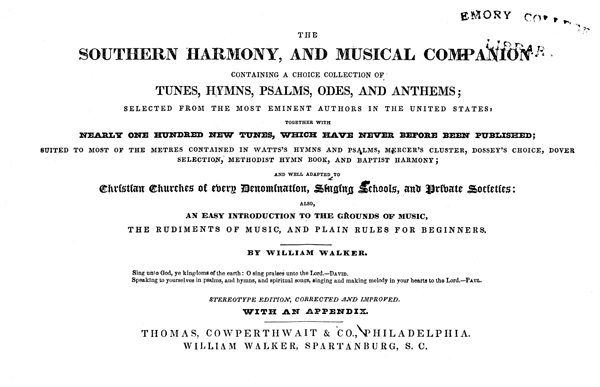 The revisions corresponded with an increased interest in sacred harp singing in Georgia and Alabama, and the publication of the book caused a dispute with the writers of the Cooper and White revisions over the rights to the music. 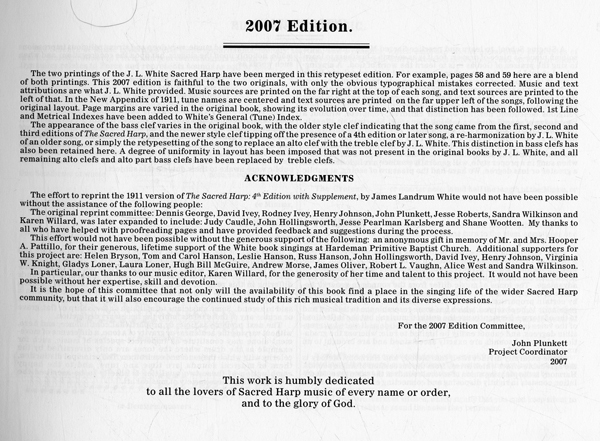 In content, the James book included most of the content of the original Sacred Harp, adding songs that had been included at one time and later discarded. The Sacred Harp Publishing Company was organized by Thomas Denson in 1933, and purchased the rights to The Sacred Harp from the James family. Most of the editorial work on the revision was completed by Paine Denson. The Denson revision removed 176 songs and added 41 newer ones. The most major change included re-writing a rudiments section, although the songs themselves remained standard for the type. The following items represent other forms of shape-note singing and significant volumes in the tradition. 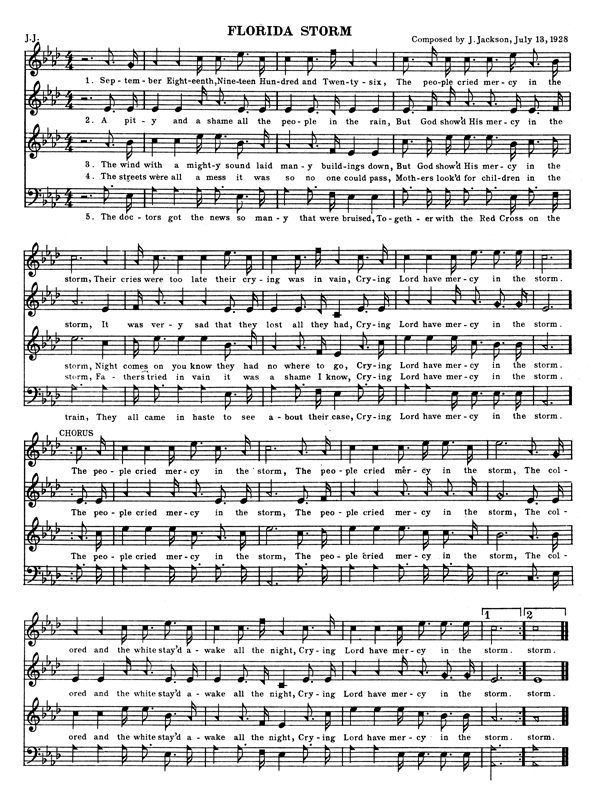 Presenting hymns similar in style and tone to other sacred harp hymnals, The Colored Sacred Harp contains some tunes notable for their varying syncopation, such as the song pictured here, Florida Storm. Jackson modeled this tune book after the Cooper revision of The Sacred Harp. 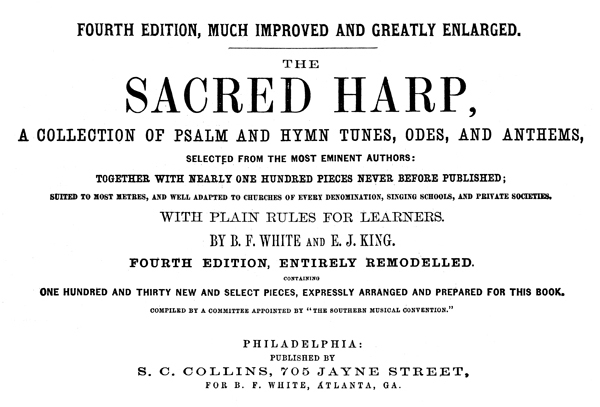 The book did not catch on widely in the African American sacred harp tradition, which used the Cooper Sacred Harp book most heavily, but it did find some lasting recognition, particularly at the Jackson Memorial Sacred Harp Singing held at Union Grove Baptist Church, the church Judge Jackson attended, in Ozark, Alabama each April. 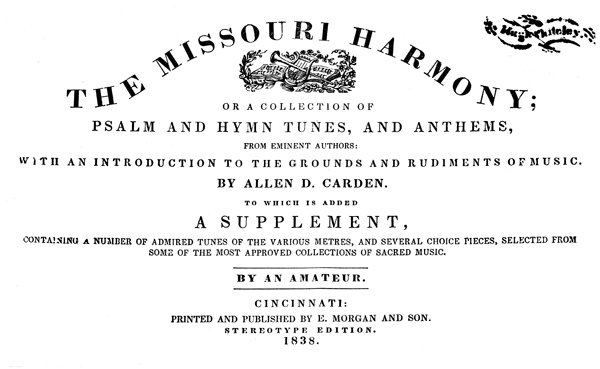 The Missouri Harmony went through at least 23 printings between 1820 and 1857, making it an incredibly popular tune book throughout the expanding Midwestern territory from St. Louis into Wisconsin and southward into Tennessee. In time, tunes were replaced in popular song by Victorian round-note melodies. The Missouri Harmony was reproduced in 2005 by the Missouri Historical Society Press [2005 MISS]. 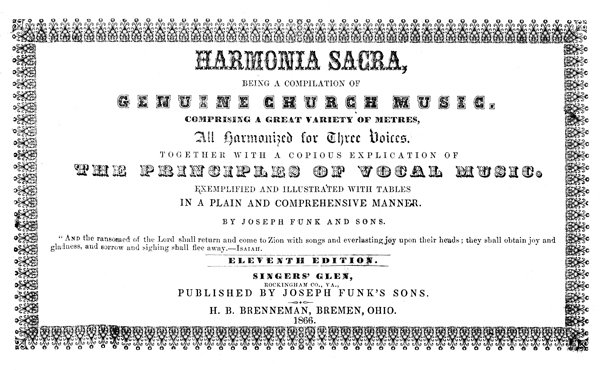 The Harmonia Sacra reflects a departure from Funk's 1832 volume, A Compilation of Genuine Church Music, which used the four-shape notation system common to works like The Sacred Harp and the Southern Harmony. Instead of that system, beginning in 1851 the Harmonia Sacra employed a seven-note system. The volume was written to serve the musical needs of Mennonites in the Shenandoah Valley. 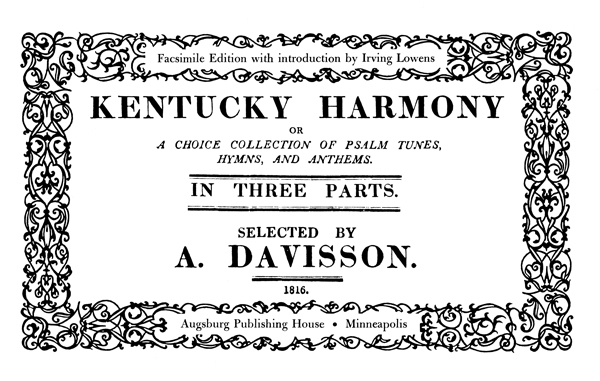 First published in 1816, the Kentucky Harmony employs no sharps and flats and frequently misplaces notes on the wrong staff, indicating Davisson's self-taught music composition skills. Davisson focused on creating four-part harmonizations, adding pieces where earlier editions of a song had used only two or three parts. In the same year, Joseph Funk brought out a German-language songbook, Die allgemein nützliche Choral-Music, that contained two songs attributed to "der Kentuckie Harmonie," testifying to the quick popularity many of Davisson's tunes garnered. 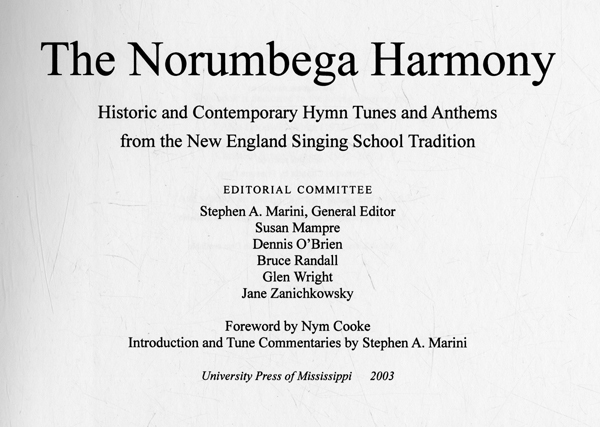 The Norumbega Harmony combines 106 sacred harp tunes from early New England with 30 contemporary compositions. Consulting the first editions of hymns selected, compilers did their best to spread the New England history of sacred harp singing. The sacred harp community is valued as much as the singing by many regular attendees. Numerous writers have described how they've met friends and spouses and connected with older and younger family members over the course of sacred harp singing days and conventions. The items below illustrate some of these aspects of this singing community. 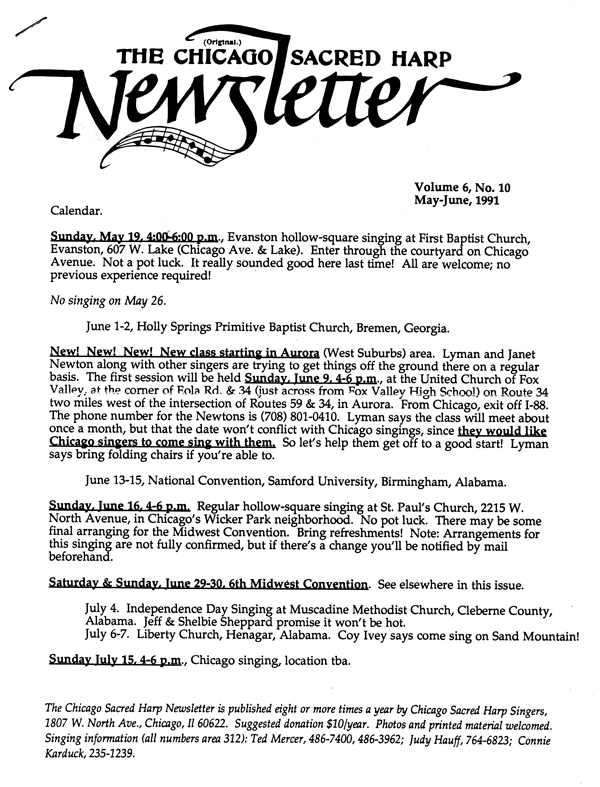 Newsletters from sacred harp singers around the country attest to the tradition's growing popularity outside of the Southeastern United States. 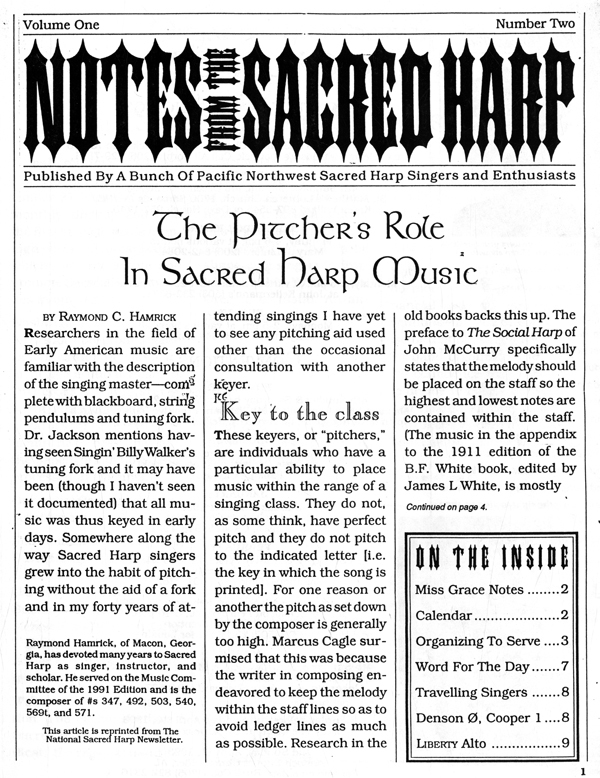 In this article published in the Chicago Sacred Harp Newsletter, a sacred harp singer from Boston describes the origin of the Norumbega Harmony singing group and dismisses the idea that the group is a performance group rather than a regular sacred harp community. Hugh McGraw became an influential promoter of Sacred Harp singing. 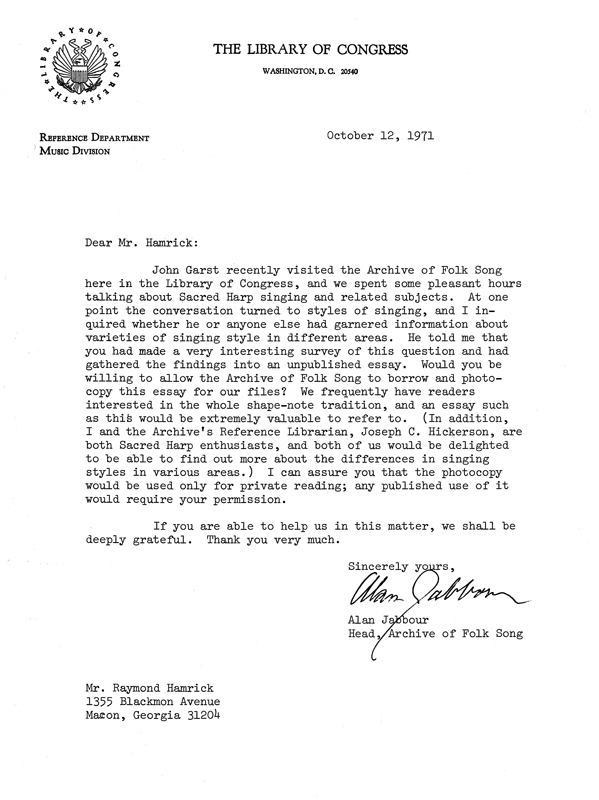 In the letter here, he encourages singers to turn out for a recording of their music. 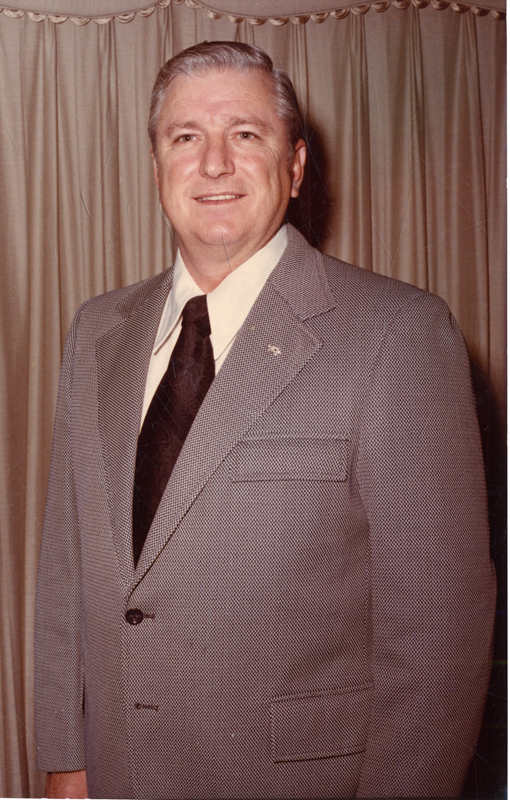 McGraw also served as President of the National Sacred Harp Foundation, dedicated to preserving the history and heritage of the singing style. 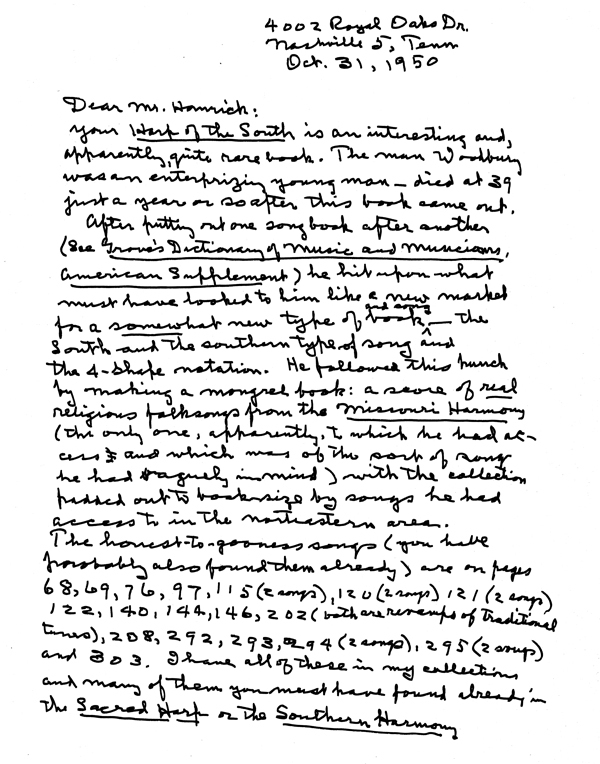 These letters with the Head of the Archive of Folk Song at the Library of Congress illustrate Raymond Hamrick's ongoing involvement with learning and preserving the history of sacred harp music. 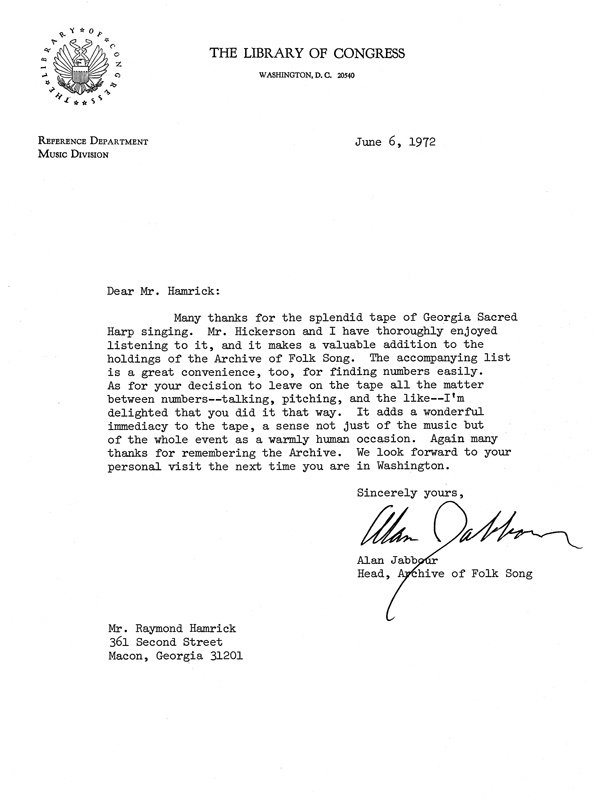 He contributed a tape of sacred harp singing in Georgia to the archives and retrieved articles that informed his and his wife's work on the history of sacred harp singing. The following articles about the history of shape-notes and the role of the pitcher are from the pen of Raymond C. Hamrick, a lifelong resident of Macon, Georgia, and a longtime sacred harp singer and composer. 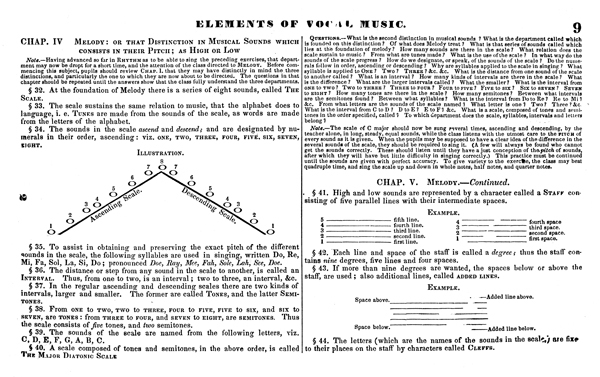 In "The curious history of shape notes," Hamrick describes the state of musical knowledge that readily adopted a system of associating a particular shape with a particular sound. 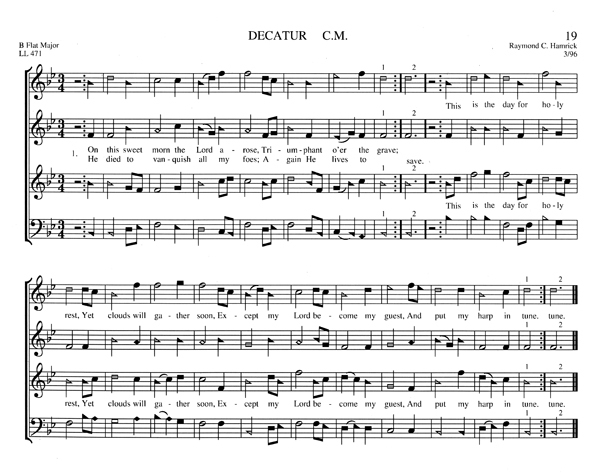 In "The pitcher's role in sacred harp music," he discusses the method by which four prominent pitchers determine the tone at which a song should be sung, commonly a tone or a tone and a half lower than the pitch at which the song is written. Hamrick, Raymond C. "The curious history of shape-notes." Unpublished article, 1968 (Published in the National Sacred Harp Newsletter in 1978). Hamrick, Raymond C. "The pitcher's role in sacred harp music", Notes from the Sacred Harp 1(2): 1, 4-7. Hamrick, Raymond C. "Sojourn in the South—Billings Among the Shape-Noters." Unpublished article, n.d.
Raymond Hamrick became recognized as a knowledgeable voice in the sacred harp community, as these letters illustrate. In 1950, Pullen wrote, "It is indeed a pleasure to find one like you, a real Southerner, so deeply interested in his own native music. It is usually the Northerner who sees beauty in it and the Southerner who despises it." 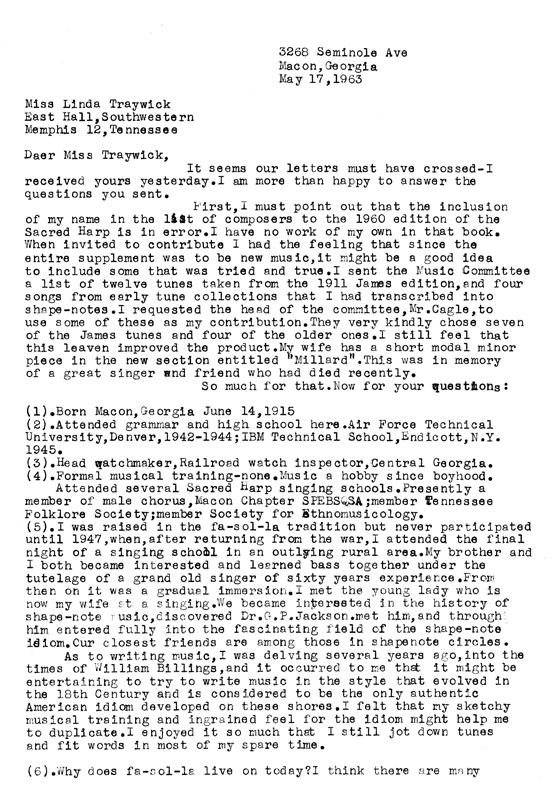 In this 1963 letter to Linda Traywick, Hamrick notes that while raised in the fa-sol-la tradition, he became personally involved in 1947 after returning from serving in World War II and attending a singing near his home. 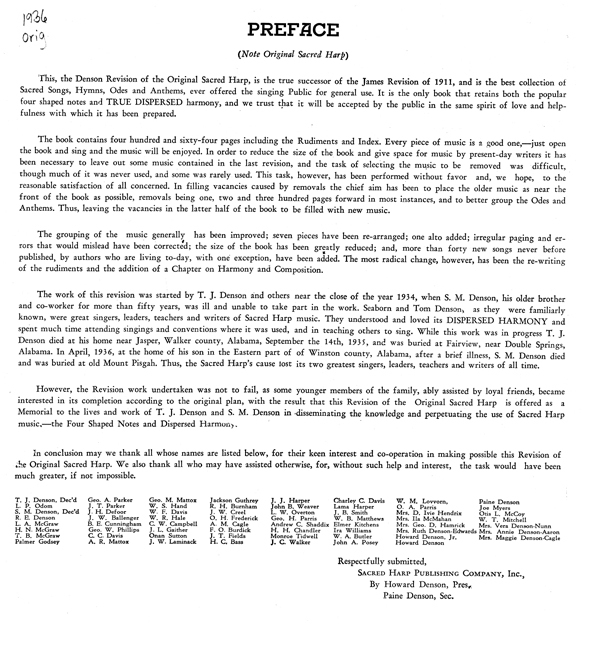 He also expresses appreciation for the recent interest in sacred harp singing, noting, "We have survived indifference and scorn for a hundred and fifty years and we feel that the recognition and respect that is now being accorded these old songs is but a long-overdue tribute to those sturdy musical pioneers of our country." 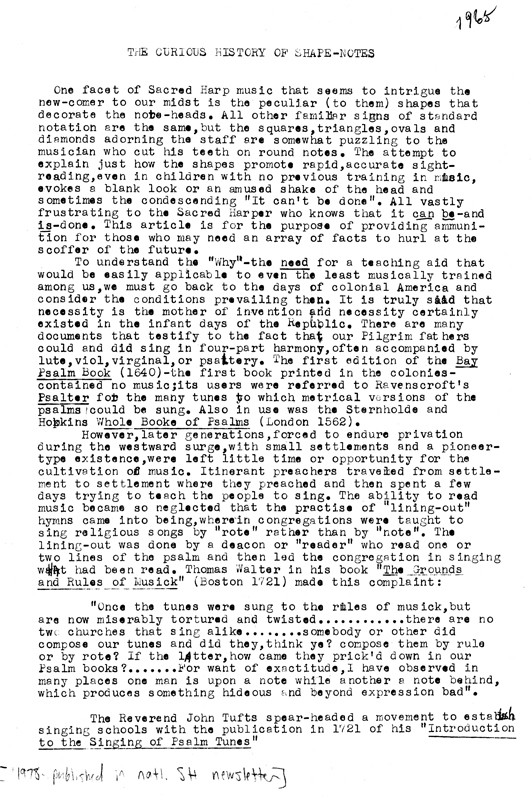 In the 1967 letter from A. Marcus Cagle, Hamrick is asked to identify some traits of a piece of music, also shedding light on ongoing discussions in the sacred harp community about how tunes should be sung. George Pullen Jackson, letter to Raymond C. Hamrick, October 1950. Raymond C. Hamrick, letter to Linda Traywick, May 17, 1963. 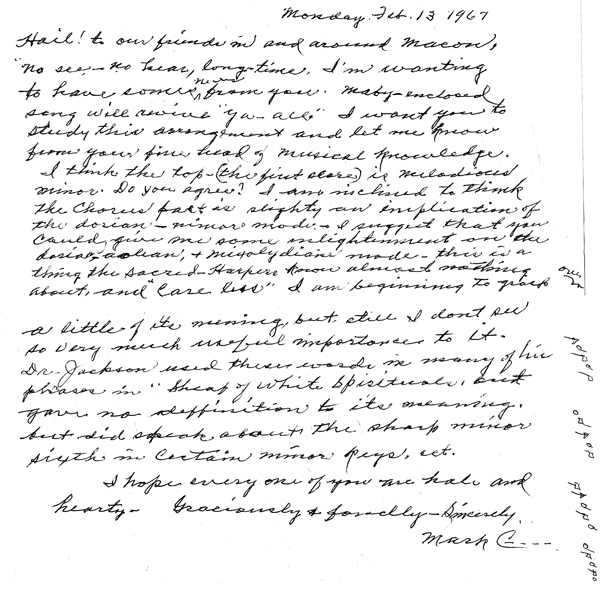 A. Marcus Cagle, letter to Mr. and Mrs. Raymond C. Hamrick, February 13, 1967. The tradition of sacred harp composition and singing continues much as it always has, with new editions of the work including newly composed hymns along with a selection of favorite songs. The items below illustrate this ongoing work.